First stop, Morimoto Dubai. The brainchild of celebrity chef Masaharu Morimoto, the restaurant serves globally minded Japanese cuisine in a jaw-dropping space on our 23rd and 24th floors. 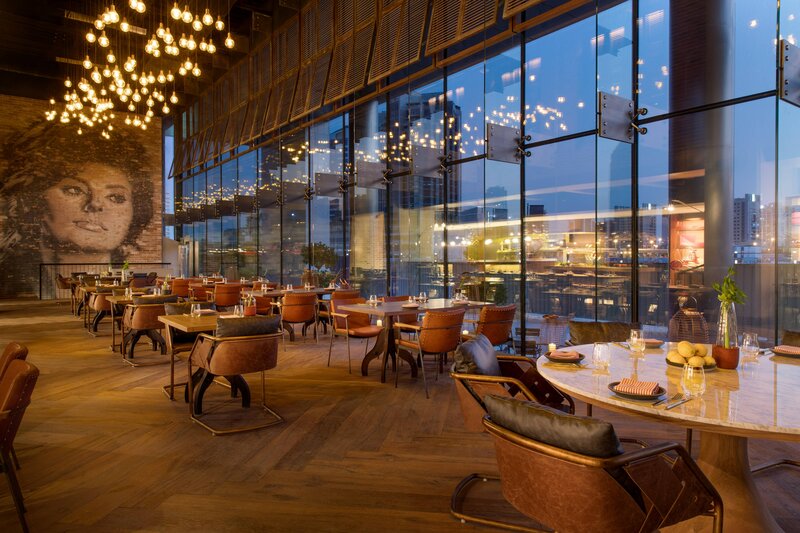 Morimoto’s floor-to-ceiling windows show off the Dubai skyline, and open kitchens put you inside the action with some of the world’s best teppanyaki chefs. BASTA!, a mouth-watering rendezvous that combines elements of a Neapolitan pizzeria, a Roman trattoria and a Florentine steakhouse overlooks the Dubai Water Canal on our ground floor. Thanks to our second in-house celebrity chef, David Myers, this buzzing spot takes Italian brick-oven fare to the next level. Bleu Blanc, David Myers’ second restaurant on site, is your French farmhouse in the heart of downtown Dubai. Complete with rustic blue doors, a floor-to-ceiling lavender garden and vintage-inspired decor, this place’s true art can be found in its wood-fired hearth. 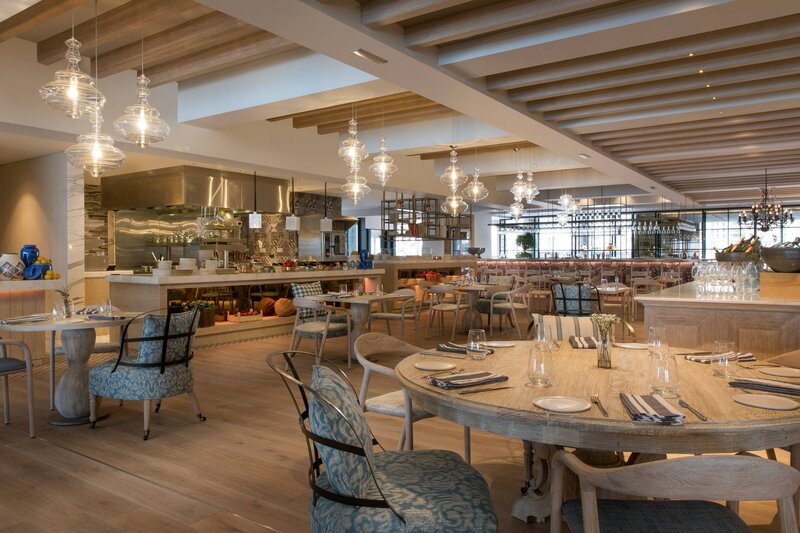 Expect premium-cut meat, fresh seafood and seasonal veggies; fresh bread is baked in an oven upstairs, with a show-stopping wine selection to top it off. BHAR, our contemporary Middle Eastern brasserie named for the Arabic word for “spice,” infuses modern cuisine with a sense of tradition. Indulge in unexpected twists on classic local dishes, like black cod sayadieh, crispy soft-shell crab saj, and karkadeh iced tea. When the 9-to-5 is over, the BHAR lounge transforms into a magnet for midnight-hour entertainment. Need a buzz? Grounded is at the ready to give you a sip. Locals know these are some of the finest ground beans around, so chances are you’ll see them here. Sit back and relax as plate after plate is served at your table, accompanied by signature drinks, designed by internationally acclaimed bar guru Sam Ross, and French bubbles. Chef David Myers presides over this stylish restaurant, which offers a taste of Southern France here in downtown Dubai. Highlighted by a rustic wood-fired grill, Bleu Blanc also features a refined bar; sip an aperitif to the soundtrack of eclectic beats. Helmed by Chef Mohanad Alshamali, BHAR is a Middle Eastern-style brasserie with lovingly crafted dishes that are as beautifully presented as they are delicious. Join us for an exquisite meal as the sun sets on another successful day in downtown Dubai. A contemporary blend of traditional Japanese flavors and Western influences awaits at this expansive restaurant, which spans the 23rd floor of our hotel. Morimoto Dubai showcases two terraces, a bar, and sushi counters. Hotel guests and Dubai locals can&apos;t get enough of our lively Italian restaurant, which combines the elements of a Roman trattoria, a Florentine steakhouse and a Neapolitan pizzeria. 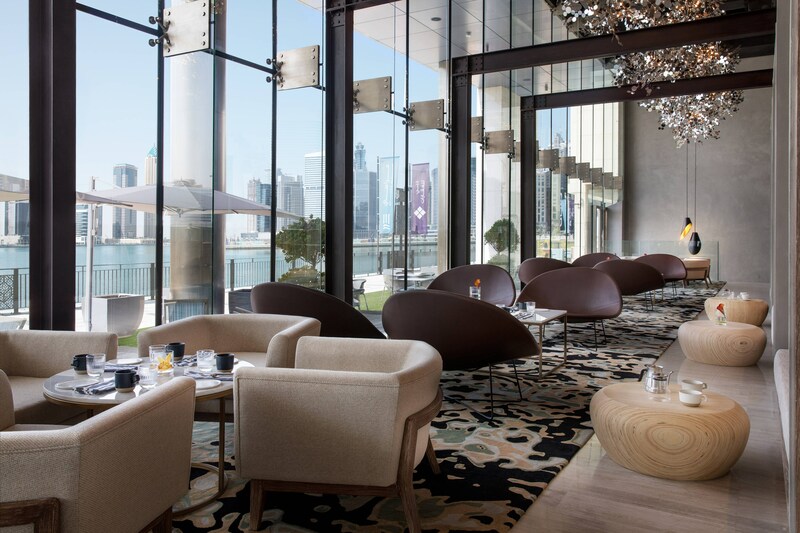 Dine in style with the Dubai Water Canal as your backdrop. Fuel your downtown Dubai adventure at this cheerful eatery, which offers locally roasted Seven Fortunes coffee, as well as fresh-baked snacks and other on-the-go items. Tempt your taste buds with British cuisine at The CROFT within our 4-star hotel in Dubai. This casual restaurant is open for dinner and offers a creative twist to traditional British fare. 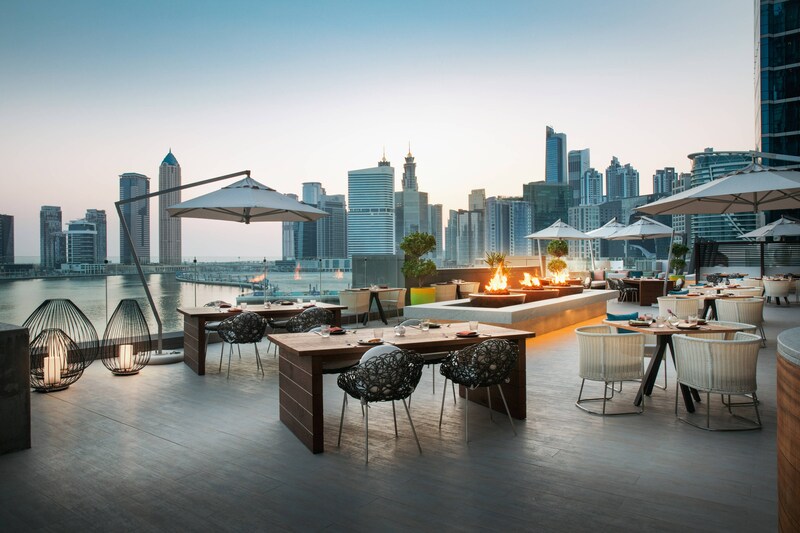 Set on the 52nd floor of our hotel, Observatory Bar & Grill showcases 360-degree views of Dubai Marina. Dine on international cuisine at our signature restaurant, or enjoy happy hour at our bar. Our Friday brunch buffet is one of the best in the city. Indulge in Peruvian flavors in a vibrant and inviting space with weathered wood tables, greenery, background house music, dimmed lights and mouthwatering food to share. Socialize, unwind and experience a Peruvian sharing concept. Offering traditional comfort food in a casual environment, our Velocity restaurant allows guests to feel at home while traveling in Dubai, UAE. Velocity is a dynamic restaurant, bar and lounge screening sports from around the globe. Explore modern Indian cuisine here in Dubai. Crafted from fresh, flavorful ingredients, the dishes at Rang Mahal by Atul Kochhar are sure to please every palate.